This past October in New England was unseasonably pleasant, but in the last couple of weeks it’s finally started to feel like winter is closing in. Many folks opt to put their bicycles away once the high’s drop from 60-something to 40-something, but last winter I was dreading the return to public transit so badly, I made a different decision. I’ve only cycled through the winter once, but I can tell you it’s a lot less crazy than it sounds. Boston winters are usually pretty mild–I put a number of restrictions on the weather I would ride in (see below) and I still had at least one day a week through most of the winter that I could commute into Boston on two wheels. Having said that, there are a few things that I found made it more manageable and comfortable. Here’s a few of the things that I learned from my year-round cycling experience for anyone who might be considering winter cycling. I’m a big fan of warm toes, so I love my shoe covers! 1. Invest in a bit of additional gear, but don’t go nuts. It’ probably common sense, but whatever clothes you were cycling in this summer won’t get you through February. But before you go to the bike shop and load up on winter gear, look around at home. I found that my cross country ski gloves worked just fine as bike gloves when temperatures dipped below 25. Different people have different tolerances for getting cold and wet, so I can’t say definitively what you’ll need to make it work for you, but the trick is to dress a bit cooler than comfortable if you were standing around outside. Don’t over dress–you’ll be warm enough about five minutes into the ride and having to remove layers mid-ride is a pain. 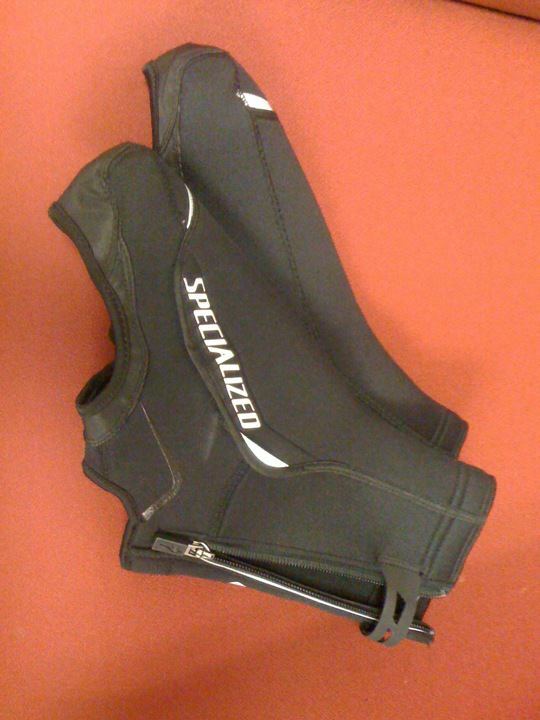 Here’s the most simplistic winter riding gear list I could come up with. 1. A waterproof bag to carry a change of clothes in. 2. A pair of gloves that leave enough dexterity for shifting and braking. 3. A rain shell, either with a liner or paired with a fleece/wool layer. 1. Fenders and/or all-season tires. 2. Insulated or wool tights. 5. Extra lights and/or reflection tape. 2. Lube often, preferably with all-weather chain lube, and don’t forget your tires. I mentioned in another post how much happier you’d probably be as a rider if you keep your chain lubed and your tires full. This still applies in the winter, with a couple of caveats. Your chain will likely need to be lubed more often–Boston winters mean a lot of sand and salt on the road. You’ll want to pick up an all-weather chain lube like Epic Ride so that you don’t spend your life lubing your chain, but it’ll still be more often than you needed to lube in the summer. You may find you want your tires slightly less full in the winter months too. Some of the friction that I wrote about avoiding in the summer can actually be your friend if the roads are a bit slick. I have 90 psi tires and I try to keep them there in the summer, but in the winter I usually leave them at about 75 psi. 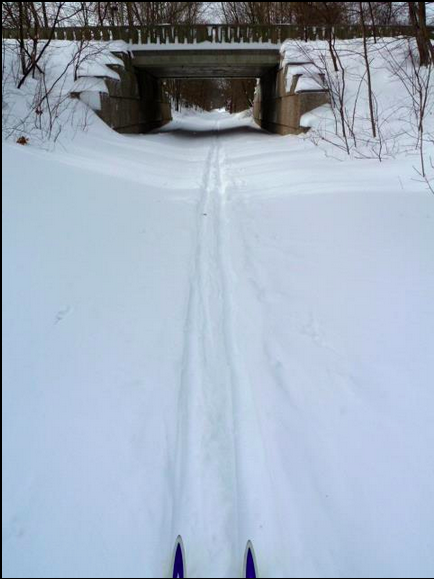 This is what the Minuteman Bikeway looked like this past winter. Great for skiing. Not so good for cycling. 3. Obey all traffic rules and be extra nice to drivers. I gave you all kinds of reasons for doing this in a previous post, but this is especially necessary in the winter. The roads are often narrower, in many cases with snow banks completely burying the shoulder or bike lane, forcing cyclists into traffic. (And forget the bike paths–they’re not likely to be plowed to cycling standards.) This makes everyone nervous. Acting in predictable law-abiding ways, signaling turns, and doing everything you can to be visible are all ways you can make the situation less terrifying for everyone. 4. Don’t forget to hydrate! It’s much easier to remember to do this in the summer, but chances are you will sweat just as much in the winter, if not more if you’re a tad overdressed. If you plan to ride regularly for more than 45 minutes, you should make sure you have a mid-ride hydration plan. If you’ll be riding under 32 degrees, I’d recommend investing a few bucks in an insulated water bottle. But however you solve the problem, just make sure your body gets the calories and hydration it needs for the rides you’ll be doing! 5. Leave yourself a little extra time. You’d probably leave yourself time to clean off the car and warm up the engine if you were driving. You’d probably leave a few extra minutes for public transit if there were even three flakes of snow in the air. The same sort of slack needs to be given to your winter rides. It’s going to take more time to get dressed in your winter appropriate gear. It’s going to take more time to ride to your destination. Winter can be a fun season to ride in and beautiful in its own way, but the experience can easily be ruined by not budgeting a little extra time to enjoy it. 6. Have a goal, but set comfortable limits. 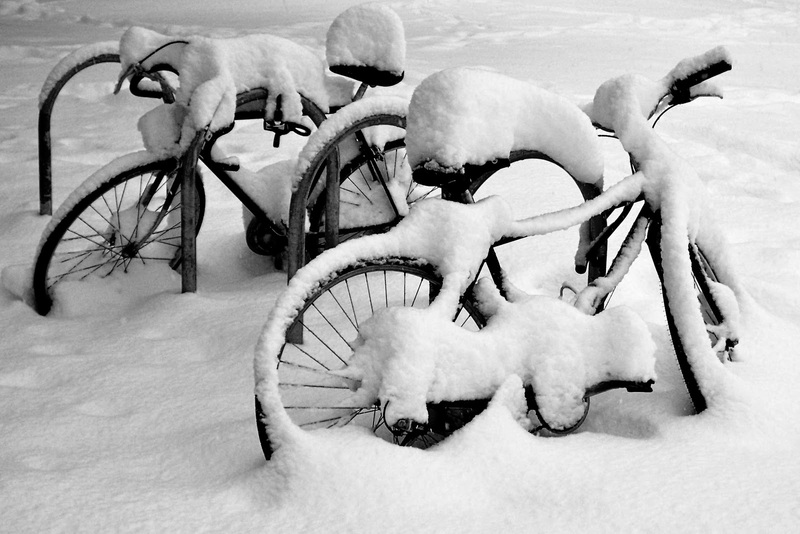 Because it takes a little more time and effort, it can be easy to intend to ride in the winter and then barely do it. I ended up setting a goal to bike in to work once a week all winter just to keep myself on track–and I was basically always glad I did it, even when the only reason I hopped in the saddle was to fulfill my quota. However, I also set some limitations on my winter riding to keep it in a realm that felt safe and comfortable to me. Your limits might look different from mine, but, if it helps, mine were: no riding under 10 degrees, no riding during a snow storm, no riding after a storm until the roads had been cleared, no riding if it was particularly icy. Predetermined limits, in combination with a goal, can make the whole thing a lot less stressful in my experience. There are tons of websites that will give you advice in much more detail–some from hobbyists, some from retailers. I particularly like the REI page, with the obvious disclaimer that they are clearly invested in selling gear. If you have other questions or tips you’d like to share, please leave them below. Happy riding! Posted on November 3, 2013 September 21, 2018 by egcharismollingPosted in The Advice ColumnTagged Boston, Cold-weather biking, Commuting, cycling, Physical exercise, Winter.